For this week, access to much of Elliott Wave International's forecasts and chart work is free. Many traders and investors boldly proclaim that technical analysis, such as that provided by Elliott Wave and others, is akin to voodoo and advise investors to stick to the fundamentals. To which I reply: ignore technical indicators at your peril. Such avoidance/arrogance (you think you are so much smarter than the market) is particularly damaging to portfolios in two instances. One, when they involve macro themes which the names in your portfolio will be unable to escape. Two, when the change in trend only occurs after a long period of time: The longer the period before trend reversal or violation, the more powerful the potential effect on your investment. We see that we have demonstrably violated the trend lines for the bull markets for the Dow Jones Industrial Average dating back to 1982 and 2003. It appears likely that we are going to test the trend line for the market dating back to 1974 for the third time this year. The market was unable to sustain a move above the 1982 and 2003 bull market trend lines during the market rebound following the Fed bailout of Bear Stearns on St. Patrick's Day. 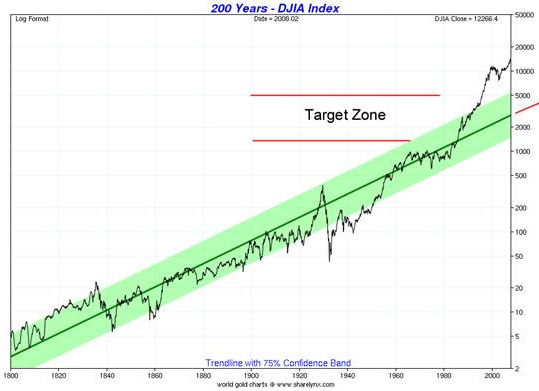 You can easily make the argument that the DJIA remains extended versus its 200-year trend line and is therefore still very vulnerable to a big correction. Few stocks would be spared in such a downdraft. Do you have a slightly greater appreciation for technical indicators? 200 years is a long time. If we are taught that movements always revert to the mean, then we are almost assured that a correction is inevitable. But when? It could be this week. I am surprised in the low reading of the CBOE volatility index (VIX) as we look to dive deeper and test the March lows in the S&P 500 and Dow Jones averages. Either traders are very confident that the March lows (and the supporting 1974 trend line) will hold or they are obliviously complacent and poised to endure much pain if it does not. The Nasdaq is holding up relatively well which is bullish as it tends to lead. The financial stocks have taken out their March lows and they also tend to lead the market. This is bearish. Perhaps market participants are betting this is the final washout for the financials and the market will soon move higher as all of the bad news is priced in. This song risks becoming a broken record. The lows may in fact hold. I am very concerned, however, with the general contentment the market is displaying as it absorbs the selloff and we approach the edge of the cliff (again). Regarding the title of this week's commentary, the party has been over for quite some time for tech, real estate, financials, and retail, yet many commentators continue to recommend them. A couple of weeks ago I was helping a friend pick mutual funds for his 401(k) plan. Of the 20 or so funds available, amazingly, none of them placed materials, energy, or commodities as the top group by sector representation—some had energy in third, but always after tech and financials—this after several years of under-performance. It just goes to show you that the vast majority of the world is composed of sheep and people are slow to adjust to long lasting trends. But what about the stuff that has been working that you had the forethought and wisdom to have beneficially invested in? The focus of this commentary, is on the groups of stocks that have benefited since 2002—base metals, energy (oil, coal, natural gas), agriculture, precious metals, and infrastructure. What will happen to them as the broader market indexes swoon? And what about emerging markets? While some emerging markets continue buck the trend of a developed world slowdown, showing signs of economic resilience, there appears to be less evidence of the ‘decoupling' of their financial markets. I think the outcome depends on whether the US Government is successful (either unwittingly or through cleverly deceptive foresight) in fighting the deflationary effects of the deleveraging of financial companies and consumers and the deflationary effects of having to service the tremendous debt overhang we have amassed over the last few decades. I remain in “camp inflation” and believe that we will hit the accelerator on the money printing machine (as will other countries around the world) and will monetize our debt and devalue our currency (more against tangible assets than other currencies). This will result in higher prices against lower wages and a standard of living adjustment we have not experienced since the Great Depression. But it might allow us to avoid a total collapse of society as holders locked into to (what will be) relatively low interest rates might be able to afford to make their mortgage payments which would be much cheaper in tomorrow's dollar terms. Keeping people in their homes might be the best we can hope for. The risk to this view is that the Government would prefer to actually preserve the value of the dollar and willfully select a deflationary outcome, or that they would fail to properly execute an inflationary scheme. To the extent our Congress is involved, you can bet they would not fail to execute in creating inflation. You can see in the chart above that the world fiat currency regime is becoming increasingly wobbly and appears to be reaching the limits of sustainability. The emerging megaphone chart pattern portends gloom for the DJIA and boom for gold as the ratio descends from almost 50:1 to 1:1. 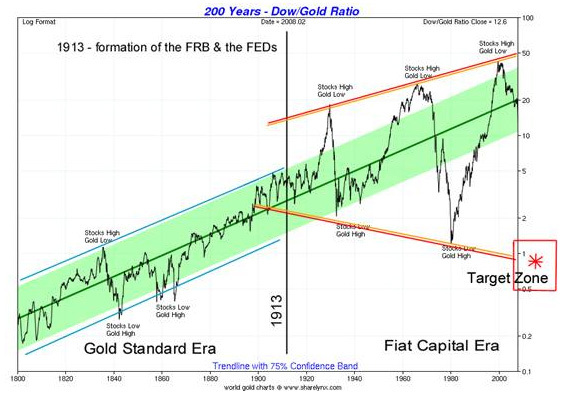 The Long/Short strategy would work best in deflationary environment and would also work for you in an inflationary world as gains the price of gold would far exceed gains in the DJIA. However, if you still hold to inflationary view, as I do, you want to be flat out long gold and not short a market that might not be rising in real terms, but would in nominal terms. 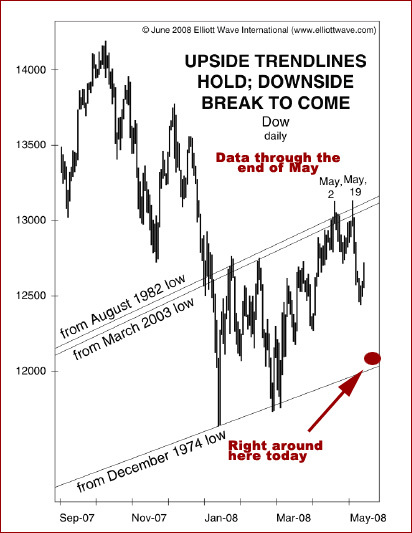 This is why it is important that the 1974 trend line hold as support. A sustained drop below it would force me to consider that we are in store for deflation and that the Fed is either unwilling or unable to prevent the deflationary outcome. We would also need to consider exiting most other commodity-related investments (with the exception of precious metals) which have worked so well for us since 2002. Commodity bulls continue to make the case that we have at least another decade for the bull market to play out. While I respect this historically correct view, I continue to believe that the "decennial pattern" is more likely and a spectacular leg to the rally into early part of next decade will result into a "blow-off top." Either scenario for commodity bulls is wrong if we are on the brink of a deflationary collapse. It is therefore crucial to monitor market activity and to see if the major support levels are breached. I expect this current episode to be another deflationary panic event and that the DJIA will hold and continue to be range-bound between the 1974 bull market trend lines and the 2002/1982 bull market trend lines for another year or so. 2009 will likely be the year to increasingly transition into precious metals and out of your other commodity holdings. In my opinion fundamental analysis and technical analysis tell a man nothing worthy. A Stock Exchange for Resale Common Stock (stock already issued, trading used) amounts to a Casino. Stock Exchange indicies get calculated upon Common Stock and not Preferred Stock, nor Warrants. Thus, what counts are resale, secondary games. The primary game at such a casino Expected Price Appreciation (belief held by the next buyer that prices must rise). Each issue is a betting game, e.g., the IBM game, the AAPL game. The handle per game is the total amount of money bet at yesterday's close. The total handle of the casino is the sum of the total amount of money bet. Price rises can happen in only a two ways. Likewise, price falls can happen in only two ways. Since new issues happen infrequently (new games started, added stock through splits), the key driver is net money flow. A man need only watch the rate of change in money that comes into the Stock Exchange Casino to know if the indicies shall rise or shall fall. For practical purposes, the Flow of Money into or out from the Casino is the only cause of price changes. Fundamental analysis can tell you only what ought to be the liquidation value of assets held by a company. This method cannot tell you the CAUSE of price rises or falls. Technical analysis tells you the EFFECT of price rises or falls through time driven by more money or less money getting bet. Stock Exchanges are CASINOS. Two games exist  Daily Flipping  Quarterly Reporting. Daily Flipping pushes any stock price one way or another based upon CONSENSUS. Quarterly Reporting annoints winners and losers from among longs and shorts between after any preceding quarter. When a Quarterly Report hits, Casino Gamblers discover who is right and hence who wins. What counts is Cash-on-Cash return from the time you BET (buy now -- go long; buy later -- go short) to the next Quarterly report. For prices to rise, more cash must become bet than cash cleared away.